Conversations Mumbai is not just an event. It's a movement to bring like-minded people together, share ideas and help each other grow in their lives. Our minds are cluttered with a bombardment of information at the speed of light. What we need are ideas! Because ideas spark conversations and these conversations trigger positive actions! “India Survival Guide” – Listen to Karl’s story of how he made India as his home and is spreading awareness in making India a tourist-friendly destination. "Epitome of Perfection & Professionalism“are what the Mumbai Dabbawlas are known for. Mr.Ritesh Andre, Spokesperson of Mumbai Dabbawalas will share their secret of perfection, professionalism, leadership, and synergy. “Mother of 90 kids” – Listen to Sujata’s story of how she took lifelong responsibility of underprivileged thalassemia kids and is bringing a positive change to their lives. 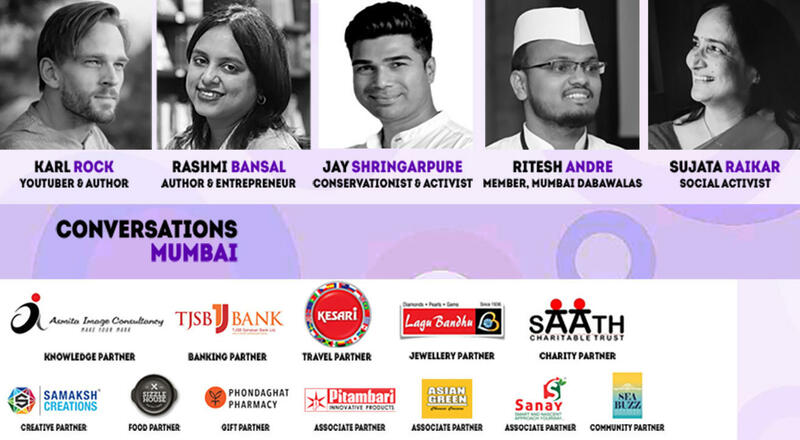 Conversations Mumbai aims at inspiring the community to step forward and take action. Through the ideas and experiences that will be shared on stage, we will facilitate a conversation between thinkers, doers and change makers and open up avenues and expose the community to future possibilities of growth in the fields of society (social work) ,art, science, technology, business, entertainment etc. Conversations Mumbai has been established as an initiative with an aim of multi-disciplinary growth for individuals from around the globe. Proceeds from tickets will be donated to SAATH Charitable Trust which works for underprivileged Thalassemia kids.